Woke around 8:30 and made some coffee. This is the earliest I have to get up all week. I know, rough, isn’t it? Of course I stay up until well past 2 am every night, so it’s all relative. Cleaned up the place a bit, took a shower, and put on the “loose” clothes. The morning class is The Body in Performance, which is a movement class, so we’re supposed to wear something loose and comfortable. For me it’s a t-shirt and track pants. It’s raining pretty heavily outside, so I make sure to remember my umbrella, and I walk to class. I only live 15 minutes from the campus, so getting there and back again is pretty painless, although on a cold, rainy morning like this all I want to do is go back to bed. Class runs from 10 am until almost 1, and we spend most of it doing different exercises all relating to how actors use their bodies and their theatrical space. I’m a director, not a performer, so this stuff is a bit foreign to me, but I figure it has to have a point. We also have a ton of readings that go with the course, and that all gets a bit cluttered in my head, but again…it all should have a point…right? Today we worked on tableaus (just click the link to find out what I’m talking about), and then I had to work on a bit where I write my name with a part of the body. I chose my wrist, and did it rather comedically, and I got a laugh out of everyone. The good kind of laugh. I hope. Grabbed some lunch with another member of the group and then we headed to the second class of the day: Writing for the Stage. Now, technically, this class wasn’t open to me, since I’m part of the Directing group, but I asked if I could audit it. That means I sit in and do all the work but don’t officially get credit for it. It’s a lot more work, but since I’ve written a few plays myself, I thought this class would be of great benefit to me. Today I read an opening scene to a play I’ve been working on. Kitchen-family-type-thing. Wrote it just as an exercise, but who knows, maybe it’ll go somewhere. We also spent a lot of time discussing The Hero’s Journey, which is something I have a deep background in, as I teach it in my classroom, and even wrote a play structured around Campbell’s myth cycle (while commenting on and critiquing it at the same time.) I found it odd that we didn’t delve into the most significant aspect of Campbell’s outline: the atonement with the father. To me at least, almost ALL stories are about dealing with your parents. But that could just be me. 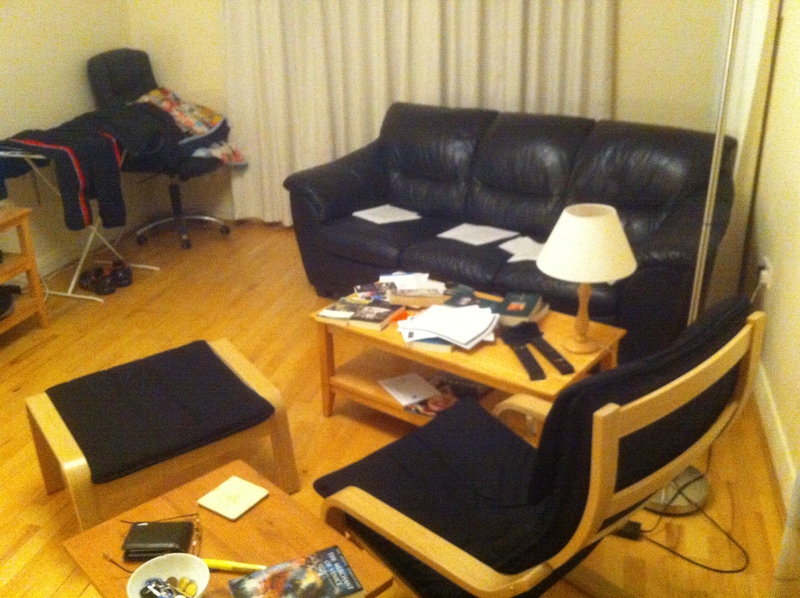 The book-strewn living room! The couch serves as my filing cabinet. After that I headed home and got fairly soaked. Warmed up in my bed a bit, watched an episode of The Simpsons, then back to work. Collected images and ideas for tomorrow’s class, which I’ll of course talk about tomorrow. Answered emails from prospective actors auditioning for some of my directorial projects/assignments, ate some fish, and now I’m writing this.